The Danish Heritage collection features hip and innovative design picking up on urban trends. The collection highlights genuine materials, strips down layers of details and honors simplicity. We always strive to create innovative eyewear by focusing on timeless good looks. Every shape fits beautifully and has playful twists of color. ".. this frame takes inspiration from an iconic piece of jewelry: the “Moonlight” by Danish silversmith Georg Jensen. 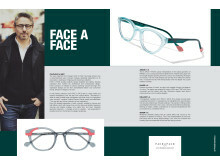 "ProDesign Denmark has matched striking block acetates with tone-in-tone mono-colors, to give a 'pop of color' to the collection .."
Did you know the WOOW - WOOL AHOOP collection is hand made in Italy? WOOW we are excited - featured in Vision Monday - showcasing the BE CULT collection. The BE BRIGHT frame features strong colors and a brave double-bridge. Stokey is an Acetate frame. Sleek and elegant, yet daring and brave. The Bergamo frame is made in Aliminium and has temples in Acetate, and fits both male and females. to play a warm contrast with the deep colors of the fronts.